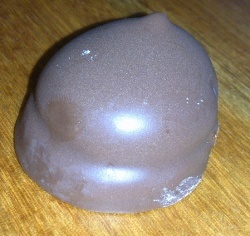 Mrs Chillikbab was of the opinion that the Monte biscuit is the same as the Chocolate Teddy Bear, simply shaped for grown-ups. Needless to say, she mostly buys Teddy Bears, after all why have a boring round biscuit when you can have a novelty one? However, I was slightly sceptical. And, when I actually tasted a Monte, it was clear that she was wrong. Ahhh, the naivety of the untutored palate! The Monte is quite different. True, it is a crunchy biscuit covered in Arnott’s dark chocolate. However, the biscuit is flavoured with coconut, and has a much crumblier texture than the Teddy Bear. Other than that, there’s not a lot to say about the Monte, really. They are quite pleasant, but somehow lack the spark that makes a biscuit interesting. It’s a kind of ‘does what it says on the tin’ sort of biscuit. 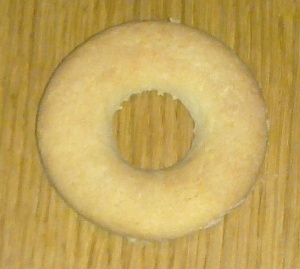 The biscuit that, if it were a person, would be someone no-one dislikes, but is kind of quiet and not very noticeable. Perhaps a six out of ten for the Monte. A few things to say about the ‘Nice’ biscuit. Firstly, it is not names after the town of Nice, France – whatever Arnott’s may say on the subject. Secondly, the Arnott’s version is not ‘The Original’, as the packet notes; it was first made by British manufacturer Huntley & Palmers well before the 1922 introduction by Arnott’s. Thirdly, and most importantly, it is mis-named. it should be called ‘Quite Nice‘ for reasons we will come to presently. 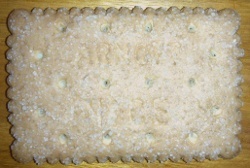 The biscuit itself is rectangular, with a scalloped edge and sixteen small holes. 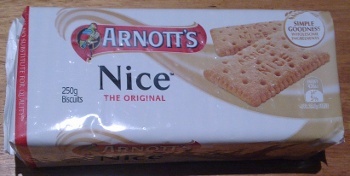 It is embossed with the words’ ARNOTT NICE’, although the wording is less distinct on the actual biscuit than the packet imagery suggests. It has a coating of sugar crystals all over the front; indeed there’s a lot of sugar on these biscuits – more than other manufacturer’s version of this biscuit, and again more than the artwork depicts. The thing that no-one relaly knows about the Nice biscuit, though, is what it tastes of. Sort of vaguely vanilla, or some say perhaps a hint of coconut. The packet doesn’t help much, as the ingredients, apart from the obvious flour, oil and sugar, just list it as ‘flavour’. So they do definitely have a flavour – it’s just undefined. So what does it taste like? Well, it’s all a bit average, really. It’s a very boring biscuit that has been jazzed up by sprinkling a lot of sugar over the top. It’s a mediocre dunker (rapid withdrawal is required to prevent break-up), and all that sugar tends to make the tea go sweet as it washes off. Not really bad, though. Just, as I alluded to earlier, quite nice. Perhaps four out of ten. 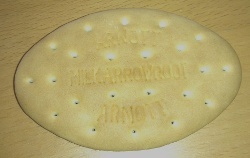 The Milk Arrowroot biscuit has a long history. It was first introduced in 1888, and in those days arrowroot was seen as an easy to digest food suitable for invalids and babies. As such, these were one of Arnott’s flagship lines, and the health-giving properties of these biscuits was marketed strongly. Indeed, until fairly recent times that the practise of mashing these biscuits up in milk and feeding them to babies as a weaning food was prevalent – perhaps this explains why Aussies love their Arnott’s so much. We now know, of course, that arrowroot is not very good for you at all, consisting as it does of almost pure refined carbohydrate. In any case, arrowroot flour is not the major ingredient in these biscuits; neither do they contain much milk. For the most part this is just a conventional plain biscuit made with wheat flour and vegetable oil. So what’s it like to eat? The biscuits are an attractive oval shape, and the first thing you realise when you pick one up is how light they are. They have a reasonable thickness to them, but this is achieved with a light, open bake. When you bite into one they are quite ‘airy’; they have a good ‘snap’ crispness as they break and they withstand dunking quite well. It’s a very plain biscuit, to be sure, but not a bad one. They are not overly sweet, and surprisingly moreish. Quite acceptable as an everyday snack with a cup of tea. Lets say five out of ten. 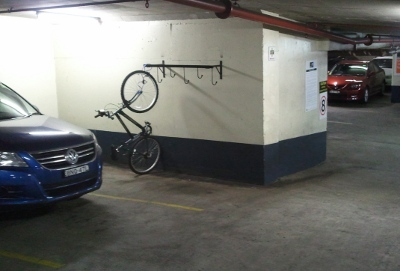 Today an email came around at work informing us that new bike racks had been installed in the basement car park, and encouraging us to use them (and more generally encouraging riding to work). I thought I should go down and check out the new bike racks. Currently I just take my bike up into the office and lean it up by the door. To be honest, I’m quite happy with that arrangement – it’s quick and convenient – but I know some people get a bit aggravated when there are perhaps six or seven bikes all piled up in the office. The new bike rack is pictured above. Now, I’m all for encouraging anything that promotes cycling, and any new cycling facility is welcome, but, well, do you think I’m justified in being a little underwhelmed by this effort? To put it in context, our building houses about 1,200 people (from a range of different companies), and there are already quite a number who cycle to work. There’s probably six just on my floor. Some time ago we looked at the dark chocolate Royal, a biscuit I spoke highly of, and gave a nine out of ten. I did in that article counsel against the milk chocolate ones, but a friend bought me a packet anyway, so I thought I’d take a look at them. I have to say, I was deeply shocked, and to explain why I have to admit to something. When I wrote my dark chocolate Royal review, I had never had a milk chocolate one. You could therefore quire legitimately call me to task for recommending the dark ones over the milk- how could I make such a recommendation, you might ask, if I had never actually tasted both varieties? It’s a good question; however one that is ultimately moot as the dark ones are much better – much much better in fact, as we shall see. Back to the matter at hand; why was I so shocked? Well, I had naively imagined that the milk chocolate version differed from the plain chocolate version in chocolate coating alone. How wrong I was! The milk chocolate version is a completely different beast. 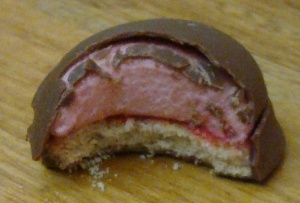 It has a thin layer of raspberry (or possibly strawberry, or perhaps just ‘red’) jam between the biscuit base and the mallow, and the mallow itself is pink. The pack itself gives little indication that this is the case; the artwork does depict this, but this is easy to miss, and indeed the pinkness of the mallow is much more pronounced in real life than on the pack. But there is nothing in the description on the pack that mentions the addition of jam. So what does this do to the taste of the milk chocolate Royal? Well, it exacerbates the sweetness of the whole thing. This is further enhanced by the milk chocolate begin sweeter (the cause of my initial reservations) and just makes the whole thing too sweet, and somewhat over-engineered. So in summary, I stand by my original conclusion. Go for the dark chocolate Royal, and avoid these. They are way too sweet to enjoy properly; after just one or too you have overloaded on sweetness and can start feeling bilious. And what use is a biscuit that you can only eat one or two of in one sitting? These merit only a three out of ten. I had occasion to add something else to the list of things I’ve carried on the Radish yesterday. 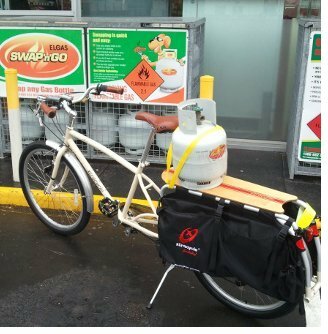 I needed a new gas bottle for the BBQ (and if you were wondering why I was barbecuing in the rain, it’s because our oven has broken, and we had a chicken that needed roasting), so rather than jumping in the car I took the Radish. With the tie-down straps I got to transport the folder on the back the other week, it opens up a whole new range of possibilities! I was on my way up to the servo, and there was a family waiting to cross the road as I went by. The dad said to the little ones, ‘Watch out for the cars – wait for the bike… the bike… wow!’, and his voice tailed off in surprise as he watched me sail by complete with gas bottle. Perhaps he thought I was on a gas-powered bike! In this important book. 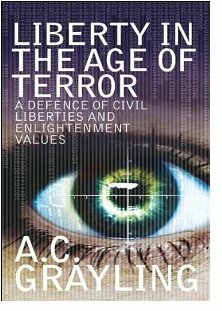 A C Grayling takes a long hard look at how, in recent years, we have allowed our civil liberties to be eroded in the pursuit of the ‘war on terror’. He examines the restrictions in freedoms we have experienced in the panic to fight an unknown enemy, and the ironic outcome that has meant that the very freedoms we believe are under threat from those enemies are being dismantled from within. He also charts the misuses of such ‘terror legislation’; demonstrating that much of it is in any case poor legislation – too broad and to long-lived. This has led to inevitable abuses where new ’emergency’ powers have been used for outside their initial scope, in areas far removed from combating terrorism. He also takes a look at what it is that makes our society what it is; the importance of civil liberties and free speech to the very fabric of how our society operates. He extends this argument into controversial areas such as the wearing of the burqas, multiculturalism and faith schools in a way that is both challenging and thought-provoking. He cogently argues that a society built on enlightenment values needs to have a zero-tolerance approach to intolerance in any form, even where that may challenge other cherished beliefs around individual freedom and respect for difference. This is an important book that deserves to be widely read if we are to preserve the values that we cherish in our society – freedom, liberty and tolerance. 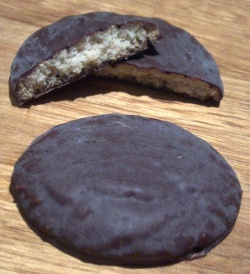 Arnott’s Rice Cookie is a gluten-free biscuit. Now, whilst I have a lot of sympathy for people living with a wheat intolerance, I have to admit my heart sinks slightly wherever I get served something that is a ‘gluten free’ version of something that usually contains flour. Normally this signals some kind of heavy, stodgy, grainy facsimile of the ‘original’. So how do Arnott’s fare with their attempt? Well, the rice cookie is an interesting shape for starters, which at once captures the imagination. They are rather brittle, however, so this imaginative shape has the unfortunate drawback of not withstanding knocks very well. Indeed, I had to sort through the packet of Rice Cookie pieces to find a whole one for the photography. Whilst they contain rice flour, as the name might suggest, the primary ingredient is in fact maize. I daresay ‘Corn Cookies’ have less market appeal, however. The other key ingredient is coconut, and indeed they have a distinct coconut flavour. They are crumbly and open-textured, and stand up to dunking admirably well. And, surprisingly, they are rather nice. Not overly sweet, they are really quite moreish and it’s actually quite easy to forget that they do not contain any wheat flour. I’d happily tuck into these with a cup of tea at any time. Perhaps the coconut does start to get a bit cloying after about half a packet or so, but this is trifling criticism. Really a top notch effort from Arnott’s, and one that coeliacs everywhere can rejoice in. I’d give these six out of ten.